How to make mince pies is the question on our lips at Christmas. Place butter in freezer overnight. Put the flour into a mixing bowl. Using a cheese grater, grate the butter into the flour and add caster sugar, almonds, and salt; zest the orange and add, then gently stir with a wooden spoon to combine. In a food processor, add the mixture, happy egg yolks and 1-2 teaspoons of water. Use a pulse action until it forms a soft dough, then place it in the fridge for 30 minutes, to chill. Roll out the pastry to a thickness of a pound coin and with a round cookie cutter, cut out about 20 rounds. 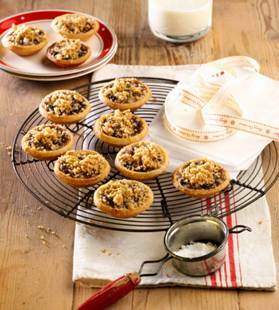 In a non-stick tartlet baking tray, press the rounds into the tray and spoon the mincemeat evenly into the pies. Make a crumble topping by quickly mixing the butter, flour, cinnamon and caster sugar in your food processor until it forms a crumble. Sprinkle the crumble over the pies, grate some nutmeg over the top and bake in the oven for 12 – 15 minutes until golden. They look yummy! Our local traditional Christmas tart is called “Christmas star” and it’s just puff pastry with some plum jam in the middle. Will try these with my kids! I’ve done mince pies like this before, as a gluten free version! I do love a mince pie!! Thank you for linking this to #DreamTeam.